Vancouver, Canada – Philips continues to expand its industry-leading LED portfolio with a new family of luminaires that offer the sustainability and energy-efficiency of fluorescent lighting with all the benefits of LED technology. ArcForm from Philips Ledalite features advanced LED engineering with state-of-the-art optics, technology integration and advanced lighting performance. A fully luminous fixture with brilliant color rendering and efficacies of up to 91.2 lm/W, ArcForm is ideal for commercial applications such as offices, educational environments and retail spaces. Inspired by the classic curve, ArcForm’s soft, understated, uniform architectural design evokes subtlety and sophistication. Its unique integration of MesoOptics technology and an innovative optical system ensure light envelops spaces adequately with unparalleled uniformity, while maximizing visual comfort and energy savings. ArcForm’s luminaire design plus MesoOptics combine to deliver a precisely controlled 3D symmetrical batwing distribution, providing perfect distribution on all planes while controlling high-angle glare and concealing the light source. Philips Ledalite has also introduced LED versions of their popular MesoOptics recessed product families for general indoor ambient illumination—Voice, Vectra, PureFX and Pique. 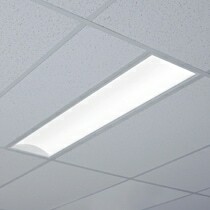 The 2’x2’ and 1’x4’ versions of these successful products are now available in multiple LED lumen packages and color temperatures, offering energy densities as low as 0.43W/ft2 . Philips Ledalite’s unique LEDLOGIQ design approach to LED features MesoOptics holographic nanotechnology, which makes spaces more visually comfortable by optimally blending light and color, controlling high angle glare and creating a precisely-controlled batwing distribution, while concealing the light source. ArcForm, as well as all other recessed MesoOptics LED luminaires also integrate Philips Ledalite Response daylight harvesting sensors, which can reduce energy savings by up to 35%. Moreover, they also integrate with Airwave wireless, battery-free, solar and kinetically powered controls to further reduce energy consumption. All Philips Ledalite LED luminaires feature an easy “plug-and-play” installation that simplifies maintenance and upgrades, and carry a 5-year guarantee on the entire luminaire system (fixture, driver and LEDs). For more information on these products or Philips Ledalite, please visit www.ledalite.com. Royal Philips Electronics of the Netherlands (NYSE: PHG, AEX: PHI) is a diversified health and well-being company, focused on improving people’s lives through timely innovations. As a world leader in healthcare, lifestyle and lighting, Philips integrates technologies and design into people-centric solutions, based on fundamental customer insights and the brand promise of “sense and simplicity.” Headquartered in the Netherlands, Philips employs approximately 122,000 employees with sales and services in more than 100 countries worldwide. With sales of EUR 22.6 billion in 2011, the company is a market leader in cardiac care, acute care and home healthcare, energy efficient lighting solutions and new lighting applications, as well as lifestyle products for personal well-being and pleasure with strong leadership positions in male shaving and grooming, portable entertainment and oral healthcare. News from Philips is located at www.philips.com/newscenter.